Photo by Thadeus Greenson The Carson Block building. Photo by Mark McKenna Bud, on the day homeless people were asked to leave the temporary parking lot camps. 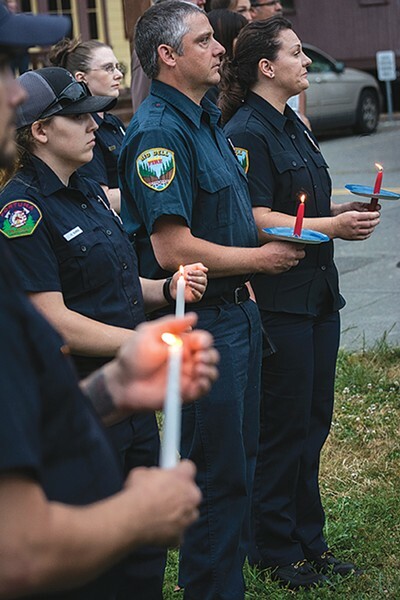 Photo by Mark Larson Firefighters at candlelight vigil for Dallas shooting victims in Fortuna on July 8. 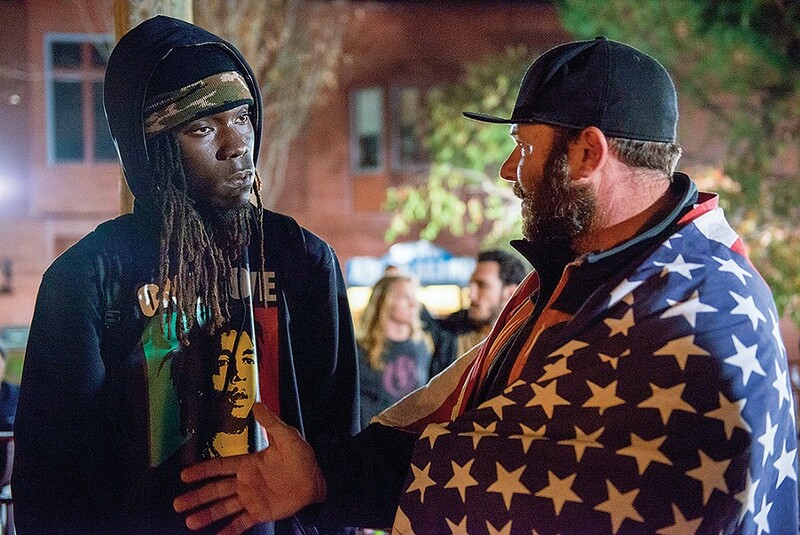 Photo by Mark McKenna Leon Stewart (left), an anti-Trump protestor, listens to Trump supporter Chris LeRoy explain his position at a Nov. 9 protest in Eureka's Old Town. Every year our editorial team collaborates to discuss the year's top stories, compiling those we thought had the most profound and lasting impact on our community. Exactly a year ago, we agreed that 2015 was a "rough year" on the North Coast, with many deaths due to drownings, suicides and homicides, and we offered our hope for a "prosperous and peaceful" 2016. We had no idea. This year, our homicide rate skyrocketed. Populist unrest spilled from the ballot boxes onto the streets. A years-long drought took its toll on our crab and salmon fisheries. A standoff between a skilled nursing home owner and a MediCal provider put the lives of vulnerable patients at risk. Several institutions — from the Humboldt Pride board to Humboldt State University — were shaken by accusations of exclusion and prejudice. Of course, bad news is always news, so it's only natural that there's a selection bias with our Top 10. Several pieces of good news — including the end of that historic drought — didn't make the cut. 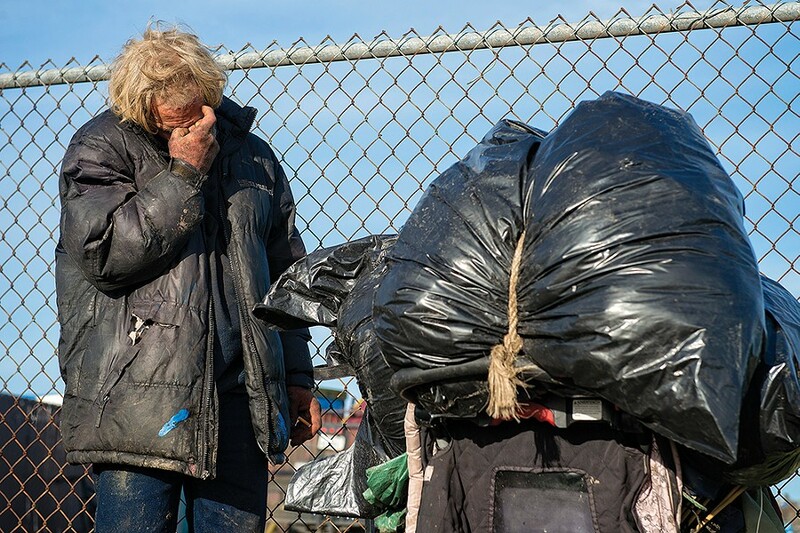 And many issues that seemed to be going nowhere just one year ago, including the region's entrenched homelessness issue and the undamming of the Klamath River, saw significant progress. So, with more optimism than irony, we present our un-ranked Top 10 stories of 2016 and renew our wish for a promising year to come. History will no doubt remember 2016 for bloodshed. As this paper went to press Dec. 27, Humboldt County had already recorded 22 homicides, by far the most in any single year in the modern record-keeping era. Eleven of the victims died of gunshot wounds, three from stabbings and four after being allegedly run down by drunk drivers. The victims ranged in age from 7 weeks to 81 years old, with six killed before their 21st birthdays. Their lives were taken in violent acts that occurred from Garberville to McKinleyville and Hoopa to Manilla, and many points between. Three allegedly died at the hands of a family member and one was killed by police bullets after a lengthy standoff. The grim tally surpasses the previous 30-year high of 16 set in 2014, and comes as the latest chapter in a three-year spike that has claimed 53 lives — this after Humboldt had averaged less than nine killings a year over three decades. Officials have offered a variety of hypothesis for the escalating violence: Humboldt county's marijuana industry; its drug culture; the death rattles of the Green Rush; and a general devaluation of human life. While the county's homicide tally has generally spiked and fallen, it's clear we are in the midst of something altogether different. Let's hope 2017 puts an end to it. In retrospect, the number of rapid-fire events that happened in the last year feels like it belongs to a much longer period of time. The year was still young when the Eureka City Council began discussing the declaration of a shelter crisis, a move that would allow the city to relax some zoning regulations and establish temporary shelters for the hundreds of people sleeping rough in city greenbelts, streets and doorways. The proposal opened old fault lines on the city council, illustrated divides between council and staff, and inspired passionate public debate. But the eventual declaration of a shelter crisis had unforeseen impacts, paving the way for such developments as the out-of-left field collaboration between Betty Chinn and HUMCPR on a shipping container village, and the "temporary rotating sleeping areas" set up in city parking lots. Both of these arrangements allowed the city to meet its obligations of "providing shelter" for the 11 plaintiffs named in a lawsuit that attempted to halt the May 2 eviction of the PalCo Marsh. In the months following that dispersal, the city formally implemented a Housing First strategy said to have housed 30 people in 60 days, abruptly ended its temporary sleeping area program after complaints from business owners, and brought the hammer down on the Budget Motel for health and safety violations, sending many people back out onto the streets. With the most severe winter in several years bearing down on us, the Eureka Rescue Mission reported record numbers of men, women and children seeking shelter inside its walls. The annual point in time count, to be held this January, might offer some metrics on the city's success in addressing this complex problem. Two historic buildings, built by contemporaries in rival cities around the turn of the 20th century, found their histories twined once again this year. 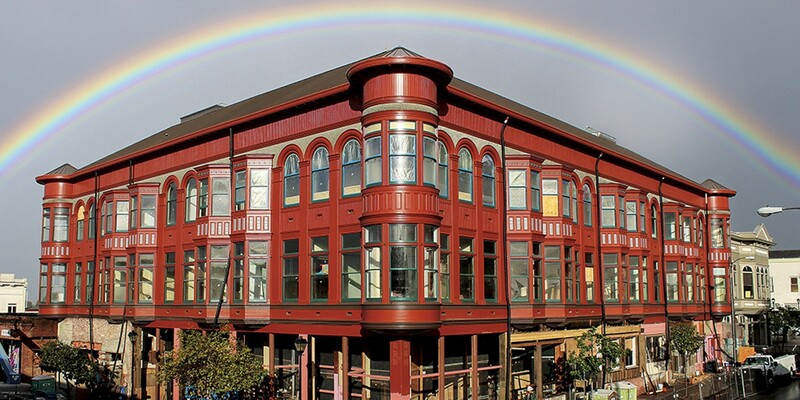 The Carson Block Building, completed by lumber baron William Carson in 1892, was restored to its original grandeur after two years of intensive work. The historic restoration included removing the stucco that had been plastered over its redwood boards in 1924, reproducing the original terra cotta tiles and rebuilding a truncated turret. 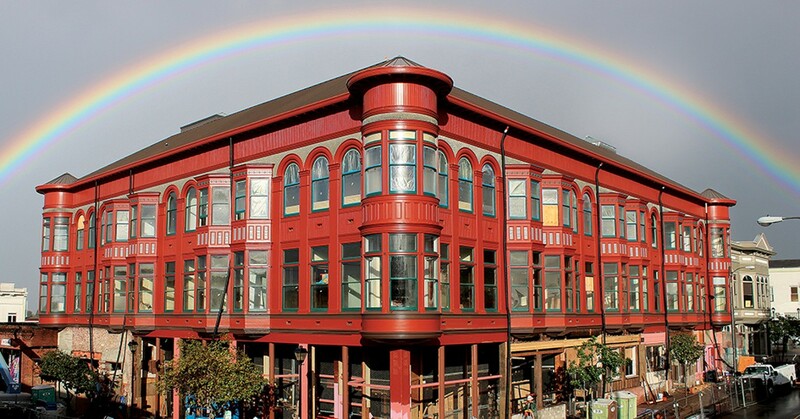 The building's current owner, the Northern California Indian Development Council, spent more than $11 million on the project, with some money coming from a community block grant and other sources. It formally opened its doors to an adoring public on Apr. 8. 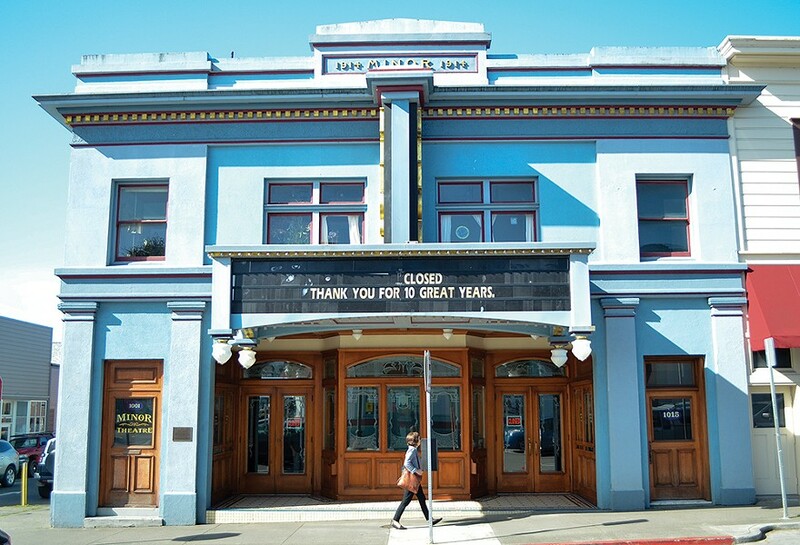 Meanwhile, across the bay, Isaac Minor's Theater, which originally opened in 1914, also got a reboot. When the previous operator, Coming Attractions, ended its contract, the building's owner Josh Neff collaborated with local cinephile Merrick McKinlay to bring table service, arthouse attractions and local beer to the renovated space. The nation's oldest surviving multi-reel feature film theater re-opened on Sept. 18 to a sold-out house. This past year's crab season was a bust, with deadly domoic acid putting a bad taste in people's mouths and leaving fishermen high and dry until May, long after the traditional holiday consumer rush. This year the news was a little cheerier, with pots in the water for recreational crab fishing on Nov. 5. Speaking at a forum convened by state Sen. Mike McGuire, ocean experts were cautiously optimistic, saying that the ocean this year was "warm and toxic," but the chance of that pesky neurotoxin impacting our crustaceans this time around was thin. Meanwhile, projections for salmon runs in the Klamath River were so anemic the Yurok Tribe was allotted less than one fish per tribal member. For the first year ever, the Klamath Salmon Festival did not actually serve salmon due to the sickly run, blamed on those "warm and toxic" ocean conditions as well as the presence of four dams on the Klamath River that block fish passage and harm water quality. Both the Yurok and Hoopa Valley tribes have filed suit against the Bureau of Reclamation, blaming its lack of mitigation for lethal infections in threatened Chinook salmon and citing studies saying more than 90 percent of the fish were infected as of last year. When we collectively closed the book on 2015, the historic hard-fought deals to remove four hydroelectric dams clogging the lower Klamath River seemed dead. Five years after the Klamath Basin Restoration Agreement was reached, it seemed to crumble, with Congress having failed to pass legislation to enact it before the Dec. 31, 2015 deadline. Many feared this would send Klamath stakeholders back to the courtrooms and lawsuits that had long defined their relationship to each other and a river from which the federal government has simply promised too much to too many. But in April, California Gov. Jerry Brown, his Oregon counterpart Kate Brown, U.S. Interior Secretary Sally Jewell and a host of other officials descended on Requa to stand near the Klamath's mouth and announce a new deal. The new accord, they said, didn't need Congressional approval and would have the dams out out by 2020. Now, the newly formed Klamath River Renewal Corporation, the nonprofit formed to take over operation of the dams as they are decommissioned, and dam owner PacifiCorp have joint applications pending before federal regulators to transfer and surrender the dam's licenses. Ultimately, the Federal Energy Regulatory Commission will have to decide whether to approve removal of the four dams and kick off what is believed to be the largest dam removal and river restoration project in the nation's history. The U.S. Department of the Interior, which has ardently supported the project, will also soon come under the leadership of a new administration. Several Humboldt County institutions were drawn into controversy this year as minority groups turned up the volume through protest, peaceful and otherwise. The Humboldt Pride board voted to dissolve in late October, after several months of internal turmoil and conflict that included accusations of exclusion and mishandling funds. The homes of some LGBTQ community members were also shot at with a BB gun the night before the Pride Parade. At Humboldt State University, an errant turn of phrase by President Lisa Rossbacher, when she said racism was "not the norm" on campus, spurred a movement and the accompanying hashtag #POCNormHSU, which students of color used to discuss their experiences with racism both personal and institutional. Rossbacher's comments came on the heels of the university's Black and Blue Dialogue, a two-hour forum focused on the subject of race and policing. The forum was sparked by the police shootings of several unarmed black men in other parts of the nation. The Eureka Police Department and the local chapter of the NAACP have also collaborated on additional discussions, with Chief Andrew Mills saying they will march together on Martin Luther King Jr. Day in January. And a host of local tribal members traveled to North Dakota to take part in a protest that has been called the "civil rights event of our time," in which more than 250 tribes and thousands of protestors joined in solidarity with the Standing Rock Sioux tribe to defy the construction of an oil pipeline. After months of protest in bitter weather, as well as violent clashes, the U.S. Army Corps of Engineers halted the project on Dec. 4. Rumblings of the coming crisis were on the horizon as early as July, when we ran into Humboldt County Supervisor Rex Bohn in a parking lot and he described the situation as "not good." He was referring to ongoing negotiations between stakeholders and Rockport Healthcare Services, the company that manages five local skilled nursing facilities on behalf of Brius Healthcare. The company formally pled poverty in mid-August, stating it could no longer afford to keep the doors of three of the facilities open due to high staffing costs. The announcement threw the community into panic, as the closure would remove more than half of the region's skilled nursing beds, potentially forcing people to move hundreds of miles away from their family members. But over the next four months it became apparent that the threat of closing might have been a financially-motivated bluff, as negotiations between the owner of the homes, Brius Healthcare Services, and the region's MediCal administrator, Partnership HealthPlan, spilled out of the boardroom and onto the pages of local newspapers. Our research also revealed that while on paper the facilities claimed a loss, they managed to send millions of dollars each year back into companies associated with or owned by Brius's owner, Shlomo Rechnitz. Brius finally backed down, only closing one facility rather than three, after Partnership refused to budge on reimbursements. Across the nation, 2016 was defined in a large part by an increasing focus on how police interact with the communities they serve and protect. A series of officer-involved shootings — many captured on video — and a string of deadly attacks on officers thrust the topic into the spotlight, spurring protests and vigils and giving birth to the Black Lives Matter movement and its Blue Lives Matter counterpart. Policing also remained a huge topic in Humboldt County, where we had five officer-involved shootings, one of which left 59-year-old David Alan Fulton dead at his McKinleyville home after a lengthy standoff. November saw the new federal courthouse in McKinleyville host a wrongful death trial stemming from the 2014 Eureka police shooting of 22-year-old Thomas "Tommy" McClain, which ended with a jury finding that both McClain and the officer who shot him were negligent. Meanwhile, in state court, the Journal won its long fight to access police video of the arrest of a 14-year-old back in 2012 — an arrest that led to the filing of criminal assault charges against an officer. The case, which the city of Eureka pushed all the way to the state Supreme Court, set a statewide precedent saying such arrest videos can't be hidden from the public as confidential police officer personnel records. There may have been no day in 2016 more world-altering than Nov. 8, which will be remembered as the day Donald Trump defied odds and pundits by winning the presidency despite losing the popular vote by 3 million votes. The days after Trump's election —the culmination of the most vitriolic White House race in generations — saw hundreds of people take to the streets in peaceful protests in Arcata and Eureka, where people waved signs scrawled with slogans like "Not My President" and "Love Trumps Hate." Election Day also had some pretty major local impacts, reshaping city councils and ushering in a handful of new measures. Most notably, voters approved a True Ward system in Eureka, a mobile home park rent control ordinance in the county and a host of school bond and local taxes. Of course, there was also that Proposition 19 thing (see below). In sum, the reverberations of Nov. 8, 2016 will be felt throughout Humboldt County — and the world — for years, if not generations, to come. Beginning with the passing of Humboldt County's commercial medical cannabis ordinance and ending with California voters legalizing adult use, 2016 will no doubt be remembered in Humboldt County as the year it all changed for the marijuana industry. After months of sometimes heated discussion, the Humboldt County Board of Supervisors passed a sweeping outdoor commercial cannabis cultivation land use ordinance. The landmark ordinance dictates what kinds of marijuana cultivation and processing — and how much — is legal, and introduces a host of new regulations to try to get growers into compliance. The new regulations mean paperwork and lots of it, which brought thousands of farmers and entrepreneurs out of the shadows, off the hill and into county offices. The ensuing flurry of permit applications (public records) made clear that some recognizable Humboldt County names — from Mercer-Fraser Co. to a sitting Humboldt County planning commissioner — are involved in the industry, connected to it or looking to dive in. Then, in July, Alex Moore's Honeydew Farms LLC became the county's first officially permitted cannabis farm after the Humboldt County Planning Commission OK'd 7 acres of cultivation in Honeydew. The county planning department, meanwhile, reports that it has received thousands of applications from folks looking to legitimize their existing operations or start new ones. On Election Day, California passed Proposition 64, legalizing recreational marijuana use. The new law not only makes it legal to possess and smoke cannabis products, it also lays out a complex regulation system for the new market. How Humboldt County's cannabis industry and the county's economy as a whole adapt to this new normal remain to be seen. But it's safe to expect some growing pains. Editor's Note: The online version of this story was updated to correct a mistake. Proposition 64 legalized recreational marijuana in California, not Proposition 19. The Journal regrets the error.